Readers of our Knife Steel Guide often ask me about Damascus Steel. This attractive yet mysterious steel has captured the imagination of many so I’ll do my best to explain what it is and how it’s made. Hence, Damascus steel is not pure. In fact, this uniqueness is its charm and its mystery. The material is characterized by multiple bands and mottling welded together in patterned fashion to create decorative blades of any shape and/or length with an inability to shatter. The identification of composites in original Damascus steel remains unknown today, as no records exist describing them. Yet modern Damascus steel-making follows the practice of combining pure metals, varying in terms of personal preference and need. Though metalworkers can choose and blend materials to form steel billets, iron is favored for its carbide-enhanced solidity and fortitude. Historically speaking, Damascus steel has adopted a somewhat enigmatic reputation, as early references disappeared around 1700 A.D., a point marking the decline of patterned swords that would cease in production some fifty years later. The ancient tradition and significance of Damascus steel, however, have never been forgotten, hence the booming industry that exists today. The sciences behind Damascus steel and steel-making are quite involved, yet they affirm the ingenuity and complexity with which Damascus techniques and processes have come to be known and respected. Metallurgy and chemistry serve as a basis for the composition and the multiple applications necessary for steel production and use. Interestingly, Damascus steel was considered something like “super plastic,” not because of some idea that it was not genuine metal—although it was never pure in that sense—but because of the durability attributed to the former reference. 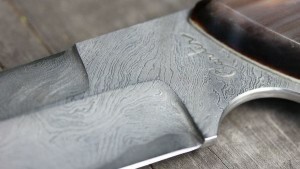 Despite the fact that various types of modern steel have superseded Damascus blades in performance, the chemical constitution indigenous to original production processes involving the latter rendered blades of the time exceptionally stringent and powerful. Since 1973, modern Damascus steel blades have been constructed from a variety of steel types welded together to form billets. These billets also routinely contain strips of iron to provide the necessary firmness on a molecular level. As a result, they are stretched out and layered according to the needs denoted by the particular application of the blade and the preferences of the blade owner. This indicates Damascus steel blades are produced not in assembly-line fashion but on the basis of individual customization. The procedure is simple: steel ingots form billets that are folded like “sandwiches” within other metal types. The resulting product can comprise anywhere up to hundreds of layers, and is certain to have a solid density and varied design. This tested process ensures both the integrity and uniqueness of Damascus steel every time. Still, the basic composition of the Damascus steel consists of two dichotomous structural types: ductility and brittleness. The former allows for compression of the material to absorb an increase of energy that would otherwise minimize or eliminate failure in the integrity of the blade. The latter is misleading, since brittleness generally relates to weakness. In this case, however, the word refers to the degree of flexibility needed to prevent shattering or breakage, as well as to facilitate edge sharpness. This structural phenomenon ensures the Damascus blade to cut easily and remain durable. The convex grind offers sharpness to the thinness of the edge so that sliced material yields to the sides during the stroke and thus minimizes “sticking” that often occurs with blades having blunter edges. The structural brittleness, then, necessitates the convex grind. On a deeper level, carbon nanotubes form in the steel to allow malleability and sustained strength during the forging process. The heavy concentration of carbon assures a decisive quality in steel integrity that guarantees high performance. This explains why carbon is crucial in the development of Damascus steel blades. During the forging process, small steel ingots gradually form into the preferred shape of a blade. This causes the alignment of iron carbides into bands that form unique patterns. These patterns are reminiscent of grains in Wootz steel from ancient India and reflect old aesthetics and style of production. Metalworkers today are able to replicate much in the same order in which Damascus steel was known to exist centuries ago. Below are the lists to the general heating and finishing processes for preparing Damascus steel. Again, the specifics vary according to need and want, as well as the type of metals being banded together. The basic processes always remain the same. The heating treatment for Damascus steel involves a preset temperature between 1,500F and 2,000F, depending on the banding, and a mixture of both cementite and austerntite. Set metal block in the furnace. Heat through its cycle to its starting temperature. After heating, soak to cool steel for ten minutes. Quench steel in oil. Transfer to liquid nitrogen for one hour. Temper steel for one hour at a temperature of 350F. This must be done twice. The following steps illustrate the subsequent finishing treatment. Apply a grit finish to the blade. Without pre-buffing, etch in 50/50 diluted solution of ferric chloride and distilled water. Leave blade in solution for a minimum of ten minutes. Remove and rinse blade in running water. Repeat cycle at five-minute intervals until achieving the desired result. The previous steps describe how to heat and finish Damascus steel while the following shows the entire process. Hence, knowledge in the former two is required beforehand in order for a metal maker to complete that which is below. This order serves as an indication of both the specifics involved and how everything works together. Making Damascus steel blades has a simple progression, yet requires ongoing care and meticulousness. Still, the process is a time-consuming one. This is necessary to ensure both desired aesthetics and the development of an effective, well-balanced blade. Collect ingredients in a crucible. These ingredients include glass and leaves known to prevent oxidation. Heat crucible to melt the ingredients together. When the crucible has reached its cooling point, safely remove the metal ingots and heat them to a temperature necessary for forging. Hammer metal while it is hot. This stage includes “sandwiching” described above. After metal cools, reheat metal to forge again. Repeat this cycle as necessary to sharpen edges and shape the blade. When the final shape is attained, cut the blade and hand-forge the final details. Shave away the carburized metal excess from the surface of the blade. Insert grooves and drill holes into the blade surface as needed or desired. Reheat. Hammer blade flat again. Polish to set the blade’s near-final form. Etch the surface of the blade with acid to enhance the pattern. When finished, clean acid thoroughly from surface of the blade. The beautiful thing about any type of Damascus knife is that, by design, it endures any forces put to it. Not only is a Damascus knife strong but also long-lasting. Below are some beautiful examples of Damascus blades I have come across. Most of the top production brands like Spyderco, Benchmade, Kershaw and others have released limited editions in Damascus recently. Knife enthusiasts like Damascus knives for many reasons. That’s a great thing because such diversity reflects versatility inherent in Damascus that is absent from other blades. The history of Damascus steel also draws favor, as it comprises a mystery that offers a sense of intrigue and enhances the ancient tradition dramatically. The most common aspects of Damascus steel knives that enthusiasts consider ideal are the aesthetics and high performance. Damascus knives boast stylish patterns that metal workers engrave into the blade during the forging process. No two Damascus knives are alike. In fact, each knife is one of a kind and valuable as an expressive work of art. As for the high performance, carbon-rich metals forged together offer a sense of power from billeting and banding that is alien to many current blade designs. This extends to the molecular composition of the blade as well as the precision and care that are typical in production, making such power synonymous with Damascus design. Are Damascus steel knives worth owning and using? Again, the answer is subjective. Blade owners would likely agree that Damascus knives serve well in certain contexts over others. Two commonly hailed scenarios are, as described above, the love of the uniqueness in style and artistic patterns, as well as the implementation of weaponry as seen in hunting and military exploits, although many chefs own Damascus knives as well. These knives are quite special and valued. Indeed they hold a unique prestige with knife collectors today. After 2,000 years, Damascus style and tradition are still going strong, and, in light of their mystique and special quality, they will undoubtedly last a long time to come.